When a sail is trimmed correctly all Tell-Tales on both sides will stream aft. If pointing too high or the sail needs trimming, the windward Tell-Tales will flutter and lift; if sailing too low or the sail is trimmed too tight, the leeward Tell-Tales will lift. • When sailing a fixed course, trim the headsail to the Tell-Tales; when sailing on the wind, steer the boat according to the Tell-Tales. • To check the fore and aft position of the sheet fairlead, sail close hauled and all the Tell-Tales should stream or lift together. If the fairlead is too far aft, the highest windward or lowest leeward Tell-Tales will lift. If the fairlead is too far forward, the highest leeward or lowest windward Tell-Tales will lift. Pack of 2 red (to port) and two green(to starboard) Shroud Tell-Tales. 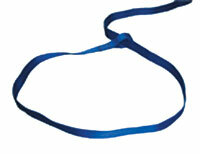 Made from Nylon ribbon with a powerful self adhesive, easy to fit to the shroud wire. Efficient and attractive product, always know the wind direction. 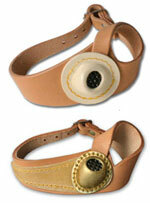 - Quick snap-in and easy side release buckles. 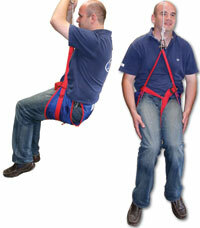 - Easily adjustable up to 1.3m. - 2m (6ft 6in) long - 25mm (1in) wide webbing. - Loop sewn at one end. Packet of 4. To cut down: Remove one end cap, cut to size with a hacksaw, file end to stop splintering and refit end cap. Nylon draw string sailbag, suitable for sails, covers, clothes or general storage. Size: 84cm high x 38cm diameter (33in x 15in) Colour: blue. Pack of 5, Size No. 1 (77mm). 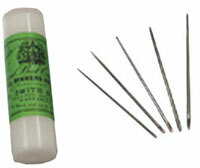 Fits: Holes from 8.5mm to 14mm, grommet sizes 1,2 and 3. Plastic rope stoppers, for tidying up rope ends and providing additional support to the knot. Pack of five assorted colours 1 of each. Red, Blue, Black, Green and White. Also available loose. Self-adhesive numbers 0-9, letters such as G,B,R (others to order) all cut from the best quality polyester insignia cloth, compatible with all types of sail fabrics. Available in a choice of 4 colours and 4 sizes. Colours Available: Blue, Black, Red and White. You need two sets of sail numbers per sail. They should be of a single colour that strongly contrasts with the sail. If being fitted to dodgers made from ‘acrylic’, we recommend that they are also sewn on. 70mm diameter 2 part clip together wheel to fit over shrouds at spreaders, lifelines, upper part of backstay or inner forstay to reduce sail chafe. Made to fit 6mm wire, but can be drilled out to fit up to 11mm wire. 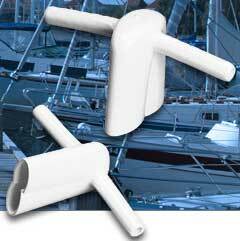 Designed to help prevent sails from chafing at the crosstrees. 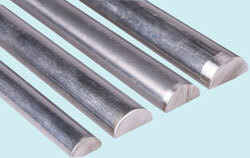 They can also be used on stanchions to prevent chafing when sheeting in. Made from UV resistant plastic. Sold in pairs. 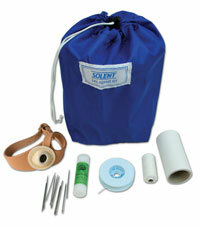 Carry out your own sail repairs on board with this self-adhesive heavy-duty Dacron sail repair tape. Suitable for use on all mainsails, headsails, spinnakers and oilskins. Easy to use. Size: 100mm x 1.37m (4in x 4ft 6in). A necessity to keep on board any yacht. 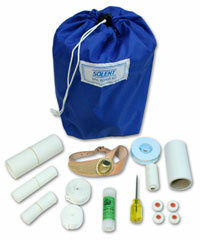 Nylon draw string bag containing all the necessary equipment to carry out any 'on board' sail reapir. Light weight Buckle palm with small covered needle guide. Buckle palm, half lined, with brass capped needle guide. Part No. 31-30 Pack of 5 assorted, sizes 14-18, 1 of each. Part No. 31-35 Pack of 10 assorted, sizes 14-18, 2 of each. Heavy duty twine for sewing and rope whipping. 1oz (30g) cop. Spike (Bradawl) for making holes in cloth etc.